TOKASHIKI ISLAND, OKINAWA PREF. 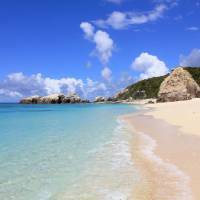 - When planning a cycling holiday in Japan, Okinawa is not the first location that might come to mind. 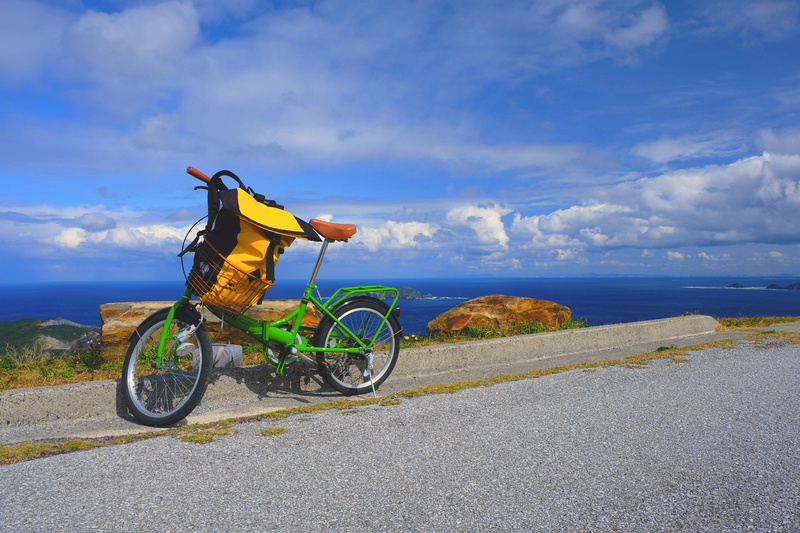 In fact, to many, Japan as a whole might not seem an obvious destination for a pedal-powered adventure. Although the country is gradually becoming something of a cycling haven as various local prefectural offices begin to invest in appropriate infrastructure, the truth remains that over 70 percent of its terrain is considered mountainous. But where there is challenge, there is reward and to me, the bicycle is the ultimate tool for exploration. The main island of Okinawa is home to the aptly named (and completely original) Tour de Okinawa, which started out as an amateur event but has evolved to become a professional one-day race, competed for by around 600 contestants from across the globe each year. Cycling needn’t be a high-speed, long-distance affair though, and the smaller islands allow for a more relaxed pace. On recommendation, I board a ferry from Tomari Port in Naha on the mainland to the island of Tokashiki, which is famous for its vibrant coral and opportunities for scuba diving and snorkeling. But I am going there for something else: the island’s long, snaking coastal roads. As the ferry rocks its way to the island, the sheer cliffs that rise gradually over the horizon bring to mind the classic film “Jurassic Park” (1993). The movie’s theme song runs through my head as I step out of the cabin to take in the view. With the wind in my hair, there is a certain majesty to the moment and I look toward the island with anticipation. As we reach Tokashiki Port, I perform a quick scan for signs pointing to bicycle rental shops and find one that appears to be a short walk away. Upon arrival, the first things I notice about the bicycles are their limited gears and small wheels; the bikes appear to be better-suited for a short commute in the city than for tackling anything with a gradient. Nevertheless, I inquire about rentals. The man behind the counter looks at me with shock when I tell him my plan and suggests renting a car instead, but my determination gets the better of me and I push for a bicycle. After some convincing, he hands me a map and sincerely wishes me good luck. 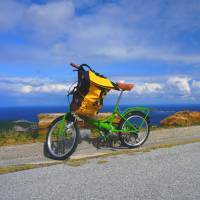 I take it, load up my bike of choice — a pleasing green number with leather saddle — and head north to the highest point on the island. I take the road behind the rental shop in stride. The pavement is wide, making the cycle safer than I had assumed. It is a constant uphill, however, so I take frequent breaks to admire the scenery and snap photographs. With each pause, the view, slowly revealing itself, entices me toward the top of the island. When I arrive at the East Observation Deck, the trees give way to an open panorama that provides views of the clear blue waters of the Kerama Shoto National Park and neighboring Gishippu Island. It is a fantastic spot to stop for a picnic lunch (though do be careful of strong winds) and I take my time to enjoy it. Tokashiki is not all pleasant, however, and after leaving the observation area, I detour to a historical site that is a reminder of the island’s grim history. In March 1945, to prevent local residents from surrendering themselves to the American Occupation, the Imperial Japanese Army compelled 330 people to commit suicide by triggering hand grenades or through other horrific acts of violence. A memorial now stands near the site, the names of those who passed away engraved for all to see. I pause and consider the event for a long while before regaining the strength to continue. A road turns right, away from the one I first took, and I decide that this would be a more adventurous way out of the area. After navigating through a large gate blocking the road from traffic, I clock up some speed heading downhill. Compared to the relentless climb of before, the rolling hills make this a sensational road to ride. A long cycle follows — across and over the center of the island — eventually leading me to the town of Aharen and the more famous Aharen Beach, where I stop for an essential snack break. I perch myself upon a deserted, elevated lifeguard stand and crack open my cream soda and chips. The sugar rush is all I need to continue but, before I leave, I am interrupted by the local cats — and a crow — who follow me until I cave and drop them some food. In the southernmost part of the island, over yet more hills, is Awanian Beach, where a sheltered cluster of benches and tables provide an opportunity to sit and stare out across the water. When the tide is out, it is possible to walk out to nearby Un Island and climb the steep staircase to the lighthouse, but I am out of luck and the tide has covered any potential routes to the island by the time I arrive. I walk around and take photographs before realizing that I need to get back on the road to avoid missing the return ferry to the mainland. On the ride back, I take a moment to reflect on my trip. Though tackling these hilly Okinawa islands on a bike is tough, if you have the motivation and stamina to power through, they prove an incredibly rewarding experience. Steep inclines and declines along the cliffs of Tokashiki make for the best views of the day, and on returning home, the scenery remains within my memory as vividly as when I first saw it. 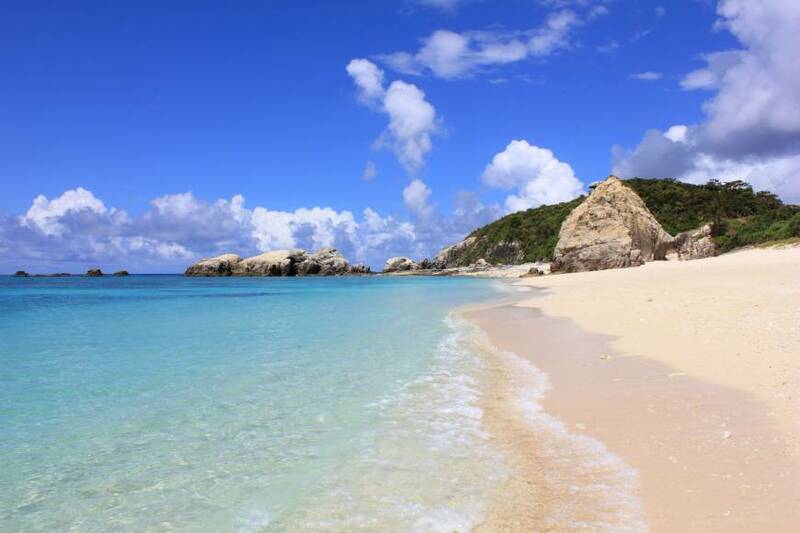 Tokashiki Island can be accessed from Tomari Port in Naha on the Okinawa mainland. The Ferry Tokashiki takes 70 minutes and costs ¥1,660 for a one-way trip. The Marine Liner is a 35-minute trip and a one-way ticket costs ¥2,490. Reservations can be made online (www.vill.tokashiki.okinawa.jp/for-visitor) or by phone up to two months in advance. Departure times are liable to change with the weather so make sure to double-check the schedule the morning of your trip. Near Tokashiki Port, bikes can be rented from Kerama Resort House (¥2,000/day or ¥2,500 for two days, one night; www.kariyushi-kerama.com).